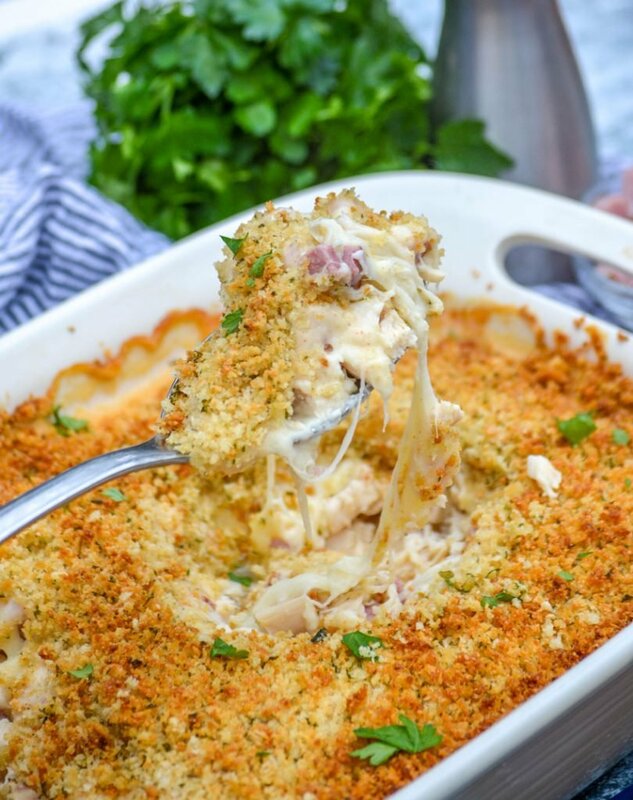 This hearty chicken cordon bleu casserole has all the flavors of the classic dish with a fraction of the work. 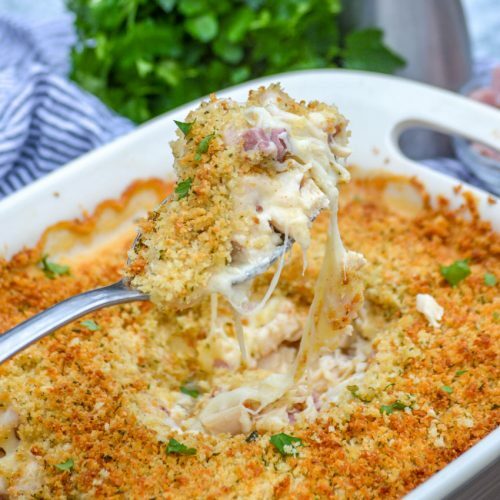 A velvety cheese sauce smothers tender chicken and ham for a delicious casserole that is fit to feed a crowd. Chicken cordon bleu is one of those classic dishes. I think everyone has had it at least once at some point because it is such a delicious combination of flavors. Chicken, ham, tangy Swiss, and a crisp buttery bread crumb coating. What’s not to love about that?!
. Finally, you’d be ready to fry it up. And you’d have to do that for each chicken breast. So if you had to feed 6 people you’d need to do all that pounding and rolling and breading 6 times. This mama doesn’t have time for that. And I mean really who does? With life as busy as it is, no one. 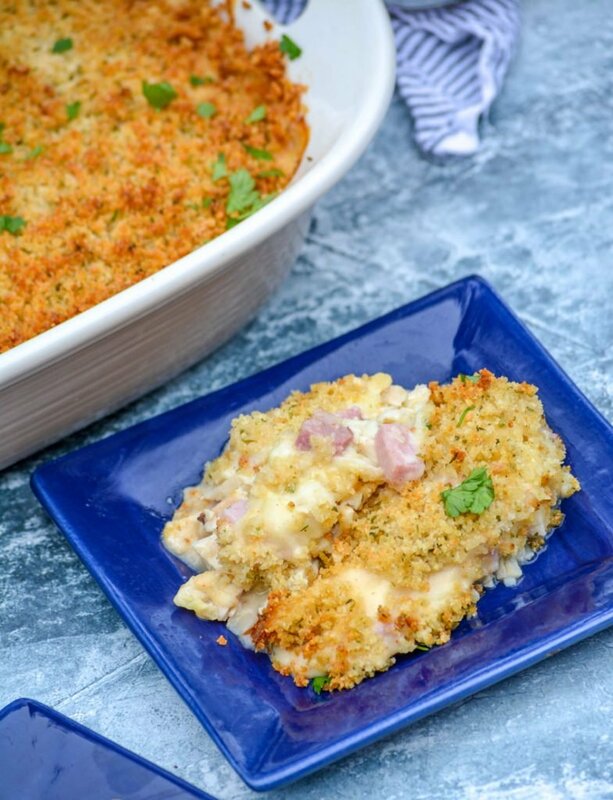 My chicken cordon bleu casserole takes out all those steps but gives you everything that’s great about chicken cordon bleu. Creamy cheesy goodness? Oh my, yes! Wait until you try this sauce. Tender chicken? Of course. Salty ham? You bet. And the crunchy breadcrumb topping? Got you covered. And the most labor intensive part of making this easy chicken casserole is making the sauce, which really isn’t that difficult. To make the sauce, you stir together butter and flour in a skillet over medium to make a roux. When the butter and flour turns golden and forms a paste like consistency, you can stir in the milk a half a cup at a time. Then turn the heat up a bit and bring the mixture to a boil, whisking often. Once it boils, it should thicken. Remove the thickened white sauce from the heat and whisk in the dijon, lemon juice, paprika, and salt and pepper. Then the sauce is done. Easy. 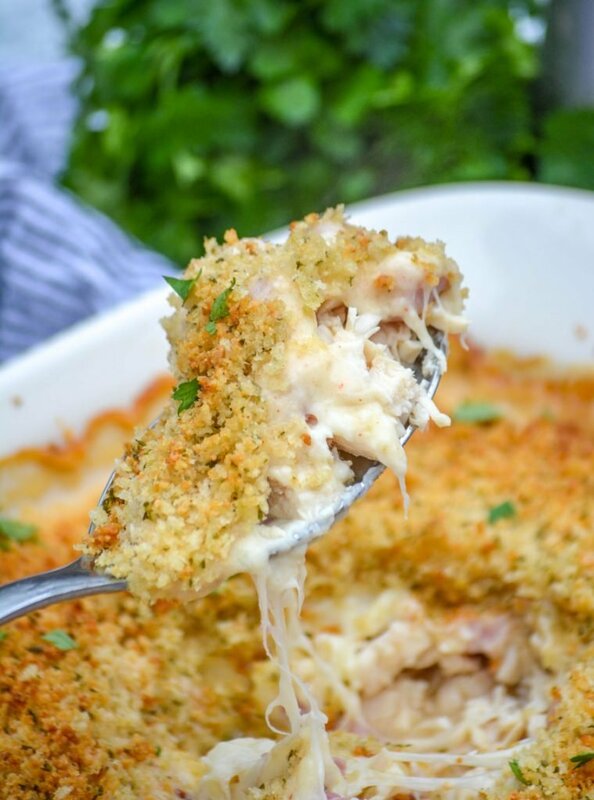 To make this easy chicken cordon bleu casserole, just chop up a rotisserie chicken. You could even use leftover roast chicken if you are looking for a way to re purpose leftovers. Lay the chicken in a casserole dish and toss with cubed ham. Cover the chicken and ham with Swiss cheese slices and just like that you are ready to cover the whole thing with the velvety sauce. Lastly, mix together some melted butter, breadcrumbs and Parmesan cheese and top the whole casserole with it. 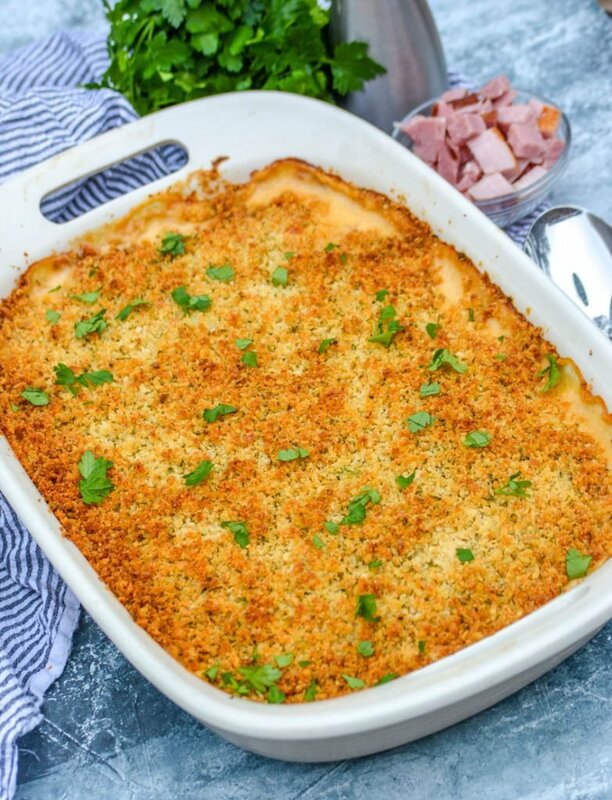 After that, just bake it and you’ve got a delicious dinner full of all the classic chicken cordon bleu flavors on the table that can feed a crowd. It’s a delicious way to use up leftover ham after holidays like Christmas & Easter, a total hit at pot lucks, and a deep dish of cozy comfort on busy days. 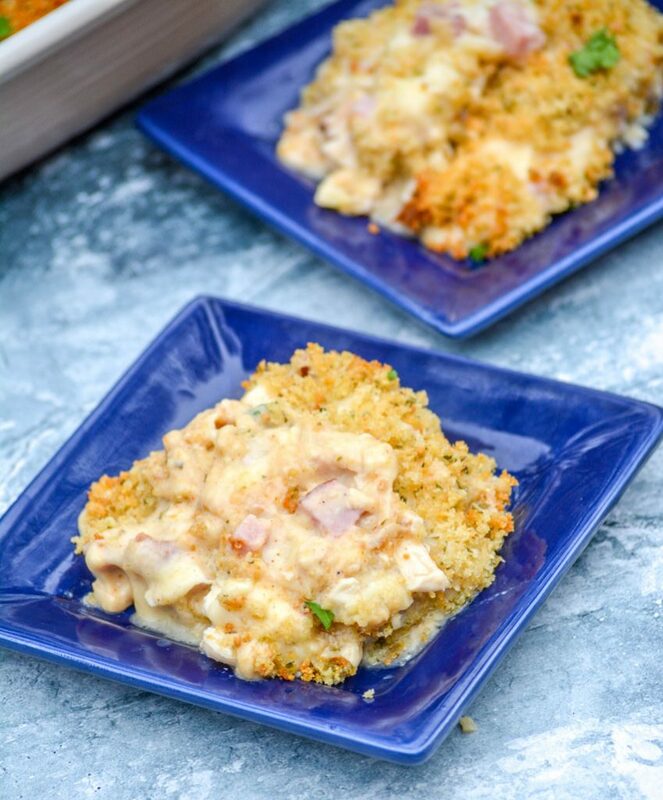 Whatever the occasion, chicken cordon bleu casserole will fit the menu perfectly! 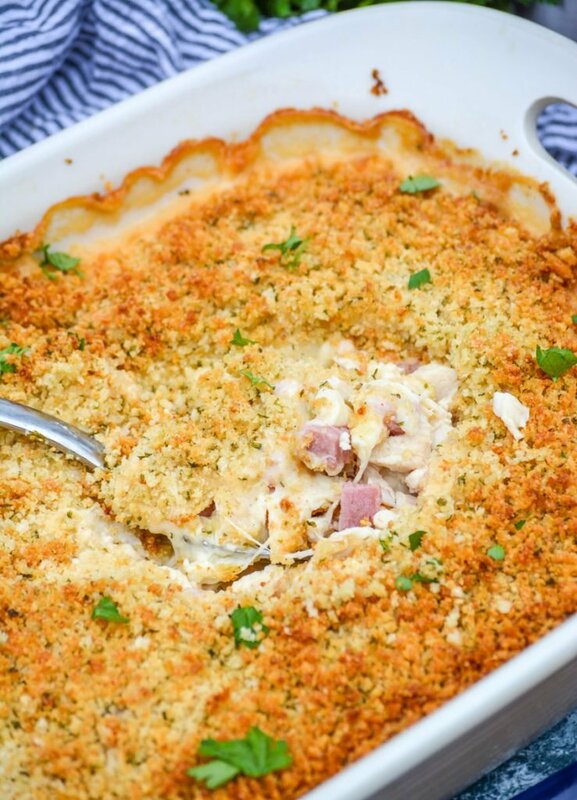 A hearty casserole that uses both chicken & ham smothered in a smooth cheese & cream sauce, this one tastes just like the classic cordon bleu dish- but fit to feed a crowd. Lightly spray a 9x13" casserole dish with non stick cooking spray. Spread the chicken evenly out over the bottom of the dish. Next, do the same with the ham. Lay the sliced cheese evenly out over the meats. Heat a large skillet over medium heat, add the butter. Once melted, whisk in the flour- stirring & cooking for 60 seconds to cook out the floury taste. Pour the milk in 1/2 cup at a time, whisking until the mixture comes together & thickens before adding the next bit. Repeat until the roux is finished and smooth. Raise the heat and bring the mixture to a boil, whisking often until thickened. Remove the skillet from heat, and whisk in the rest of the sauce ingredients until smooth. Pour the sauce out evenly over the casserole dish. You can use a spatula to smooth it out a bit and so that it seeps down the outer edges and into any cracks. Add the bread crumbs & melted butter to a small mixing bowl. Whisk them together until evenly incorporated. Spread the breading mix evenly out over the top of the casserole dish. Bake the casserole at 350 degrees for 45 minutes. Let the dish rest for 8-10 minutes, allowing the sauce to thicken, before scooping and serving.